Bittersweet Enchantment: Blog Tour: Red Hill by Jamie McGuire | Book Spotlight + Giveaway! Blog Tour: Red Hill by Jamie McGuire | Book Spotlight + Giveaway! 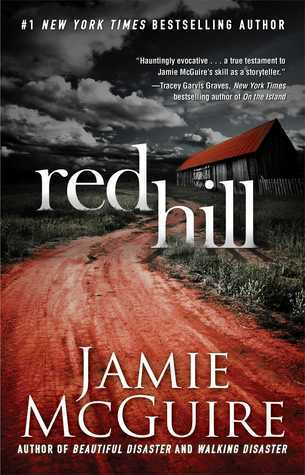 Hello and welcome to the official blog tour for the newly released novel, RED HILL by Jamie McGuire! Today is my stop on the tour and I am super excited to share with everyone all about the book. Now I was supposed to do my review on Red Hill today but sadly I have been dealing with a cold and was unable to finish reading. My review will be posted later in the week. So today instead I will sharing a book spotlight and giveaway. Enjoy! Want to win a copy of Red Hill? Must be 13+ to Enter | Shipping in the US Only. 1 Winner will get a Jamie McGuire Tote Bag as well as a Signed Limited Edition of BEAUTIFUL DISASTER, a copy of WALKING DISASTER and a copy of RED HILL. Oklahoma, and Autry Technology Center where she graduated with a degree in Radiography.Her most recent novel, Walking Disaster debuted at #1 on the New York Times, USA Today, and Wall Street Journal bestseller lists. She has also written bestselling contemporary romance Beautiful Disaster, and the Providence series.Jamie now lives in Enid, OK with her three children and husband Jeff, who is a real, live cowboy. They share their 30 acres with six horses, three dogs, and Rooster the cat. Be sure to stop by all of the stops on the tour.